The X570 offers unmatched quality, performance, comfort, and versatility in a multi-terrain tractor. It has a powerful iTorque™ Power System, an easy-to-use Twin Touch™ hydrostatic transmission, and a convenient foot-pedal lift system. The X570 features updated controls that are color-coded and easy to use, including automotive-style cruise control. It also comes standard with an enhanced instrument display that features an electronic fuel gauge, service indicator lights, a tachometer with "Best Cut" target zone and much, much more. 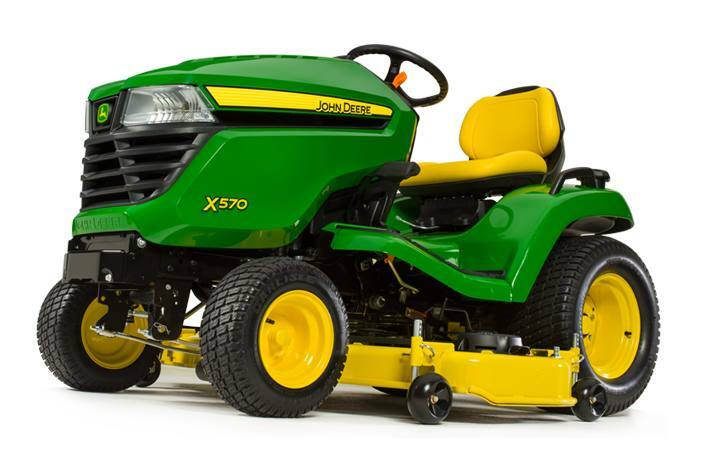 The X570 is equipped with the new Accel Deep™ Mower Deck — a deck stamped from a single piece of 10-gauge steel that's specially shaped to maximize airflow for optimal cut quality, especially at faster speeds. What makes this mower deck unique is its nearly 5-inch deep shell that extends all the way around, and its smooth shape. This deck provides superior mowing capability and first-class performance, whether side-discharging, mulching, or collecting grass clippings. Engine hp is provided by engine manufacturer for comparison purposes. Actual operating hp will be less.